Many farmers have grain bins, and have climbed the ladders up and down the grain bins for years, in all weather, without injury or trouble. “If it ain’t broke, don’t fix it” could be said about the ladders on grain bins. Ladders serve their purposes and work well, and have worked well for years, so why make changes? 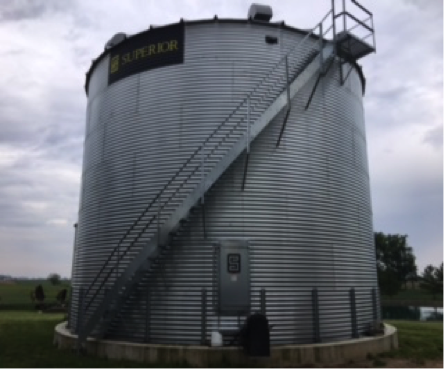 Safety, stability, and reduced risk of injury from falling from a grain bin ladder, are a few reasons to consider upgrading from a ladder to stairs on your grain bin. One of the missions of Ohio AgrAbility is to work with farmers with disabilities to identify ways to make changes or modifications to equipment, facilities or worksites to allow the farmer to continue farming. Another mission of Ohio AgrAbility is to offer resources and education to all farmers on how to reduce the risks of injury, and introduce modifications and technology that help farmers stay safe, and work more efficiently. Ohio AgrAbility has a few farmer clients who are not able to safely climb ladders, whether because their hands cannot grip the ladders as tightly as they once could, or because arthritis has affected their knees, backs, or shoulders and it is hard to climb. 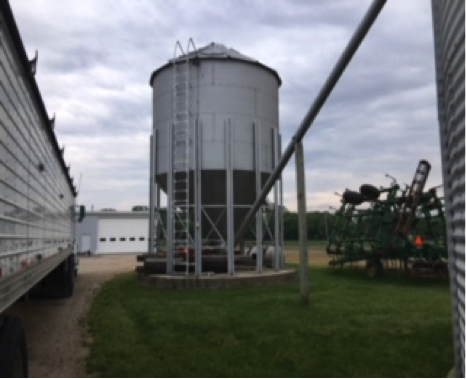 One Ohio AgrAbility client fell 14 feet off his grain bin, breaking bones, and causing internal organ damage. He has lost the use of his dominant hand, suffers chronic pain and balance issues. These injuries do not just impact his ability to climb the grain bins, he also has trouble climbing the steps to get into his tractor, hitching the tractor to implements, and turning to look over his shoulder while operating the tractor. He is still farming, but now he has stairs on his grain bins (instead of ladders). Other modifications he has added are: extra steps and handrails on his tractors, and cameras installed in the tractors so he doesn’t have to turn his head to see over his shoulder. This farmer benefits from the stairs, as does his 80-year-old father, who also climbs the stairs on the grain bin. This farm has fewer concerns about climbing stairs in bad weather. The safety and security the stairs have given these two farmers is invaluable, and has helped them to continue farming safely, without risk of more injuries from falling off grain bin ladders. 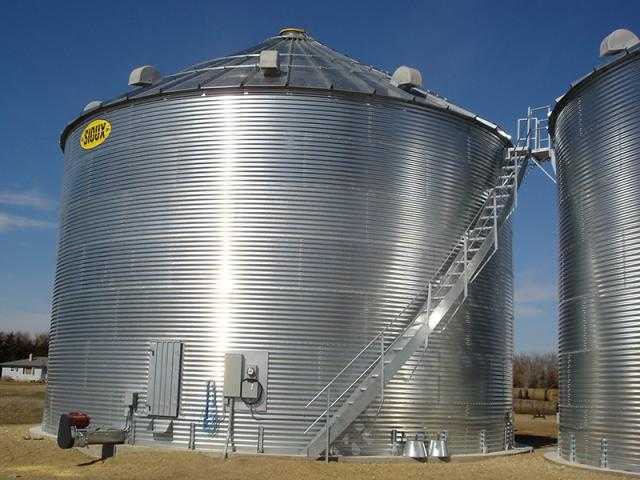 Adding stairs to a grain bin is not cheap or easy, but if you consider increased safety and reduced risk of injury or accident, versus lifelong injuries (or death) the stairs are worth the investment. For more information about Ohio AgrAbility visit https://agrability.osu.edu/ or contact Laura Akgerman, Ohio AgrAbility and OSU Extension Disability Services Coordinator, at Akgerman.4@osu.edu, or 614-292-0622.